Spending a summer in Verbier/Val de Bagnes – La Tzoumaz is a veritable voyage of discovery. It’s about allowing yourself to be surprised by the thrills of the many mountain bike and hiking trails, by the unceasingly renewed wonderment at a spectacular natural environment. It’s about savouring time with the family, whether out in the fresh air or in a museum. And finally, it’s about delighting in classical music and natural produce in a resort whose key focus is to offer you excellence at every level. Infinite experiences await you in Verbier! The new Verbier Infinite Playground Pass gives you privileged access throughout the resort and surrounding area. Whether with friends and family, a nature lover or thrill seeker, everyone will find something they enjoy in Verbier! Limitless! 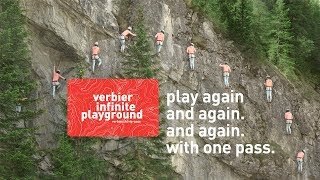 The Verbier Infinite Playground Pass is issued free of charge to all guests staying a minimum of one night in Verbier or Val de Bagnes who pay the tourist tax. Throughout the summer season, the resort buzzes with big events. For music lovers, every summer, the Verbier Festival brings together well-known classical musicians along with the up-and-coming generation between mid-July and the beginning of August. The international equestrian competition, the Verbier Saint-Bernard trail and the Grand Raid cycle race are all events which make their mark on this lively, vibrant destination. To discover more about the resort, go on the Official Tourist Office website of Verbier. The weather is clear, the Combins and Mont-Blanc ranges are awakening. A summer day begins in Verbier, encouraging visitors to enjoy this idyllic natural environment. The ultimate mountain biking destination, the region is an ideal playground with its 826 kilometres of kilometres of trails. It offers a wealth of unadulterated pleasure, pervaded by the watchwords of quality and diversity. The toughest can get out there to try their hand at a cross-country discovery excursion or two through the area’s villages and picturesque mayens (traditional wooden houses). The famous Tour du Mont-Fort, which offers a panoramic view the entire length of the itinerary, will be sure to test cyclists’ limits. For riders with a preference for downhill, the Verbier-La Tzoumaz region is a veritable attraction park. Twelve kilometres of downhill, with blue, red and black runs and the highlight in the shape of the new Rôdze trail with its 65 jumps. Nor have Enduro fans been forgotten with 206 kilometres of incredible runs divided into 18 itineraries and spread across the region’s valleys. In any event, adrenalin and emotion are part and parcel of our mountain bike escapades. Hikers will also find whatever they are looking for in this dream landscape. Spread across Switzerland’s second largest municipality, some 950 kilometres of lush hiking trails are available to hikers. From excursions accessible to all in the mountains above the resort, where the marmots are soaking up the sun, to treks lasting several days at the end of the Val de Bagnes in search of mountain huts, the possibilities between Verbier and la Tzoumaz are limitless. Families can explore the region’s many bisses (ancient waterways), the remnants of the agriculture of yesteryear. Célestin le Bouquetin, the bold ibex and her educational book takes children to the Musée de Bagnes (Bagnes Museum) and the Maisons du Patrimoine (Heritage Houses). The educational paths or Kids Days, holiday day camps, make Verbier-La Tzoumaz a family destination in which play and discovery are the key words. And while the Verbier – La Tzoumaz region can be explored with a pair of strong calves, it is also just as much of a voyage of discovery for those with a refined palate. Bagnes Municipality is the capital of raclette, and consists of five mountain dairies in which cheeses are made during summer. At the end of September, an event lasting a day is devoted to this local AOC product, each year bringing together more than 15,000 visitors. And for the more curious amongst us, activities introducing mountain dairy cheese-making are regularly held throughout summer. This authentic, semi-hard cheese is a wonderful accompaniment to thin slices of traditional rye bread baked in collective oven, and enhanced with a touch of honey from the valley.